In Autumn an old man's fancy turns to... the new EverQuest 2 expansion. Although, as I look at the historical record, the release schedule hasn't always been quite as consistent as I remembered. I would have said that EQ2 expansions arrived when the leaves were coming off the trees but there were a couple of years there, when SOE did a hop-step and punted expansions to the Spring. Normality reasserted itself after a while and the last half dozen have all released sometime in November. This year the date to mark on your calendar is November 13th and for once I am actually off work for that whole week, meaning I'll be able to enjoy the inevitable launch-day crises and first-week bugs to the full before the inevitable nerfs and fixes render the whole thing enjoyably playable just in time for my return to work. As Wilhelm confirmed, Chaos Descending will come in the usual three flavors - Standard, Collector's and Premium. I have never bought anything other than the Standard edition of any expansion for any MMORPG. Generally the base model represents very good value and EQ2's latest, coming in at under £25 with the Member's 10% discount, is a bargain. Usually I just glance at the other two, shake my head in puzzlement over why anyone would think they were worth the inflated prices, and move on. Last year the inducements to players to open their wallets wider for Planes of Prophecy seemed particularly lackluster. That mistake seems to have been rectified for 2018. For the first time in years I did momentarily consider one of the enhanced packages and even when I pressed the button to pay for the Standard pack I did so in the reassuring knowledge that these days you can always upgrade your account to Collector or Premium at a later stage. Jann Magi Illusion (Male). Fiery Book not included. The various goodies this time around include a really interesting Mercenary (GW2 Tengu fans, eat your hearts out!) and a house that is by all accounts quite spectacular, but the potential value really lies in the various boosts and buffs, which include Ascension Level boosts for all characters on the account, a max Tradeskill boost for a single character and a slew of Familiar Training potions, mercenary and mount gear. All this stuff is of very significant practical use. It makes your characters more powerful. It is the very definition of Pay to Win. Except no-one ever really calls expansions P2W, even when the bonuses accrue from optional extras. I'm particularly sensitized to this kind of advantage right now because I spent most of yesterday working on upgrading my Berserker. 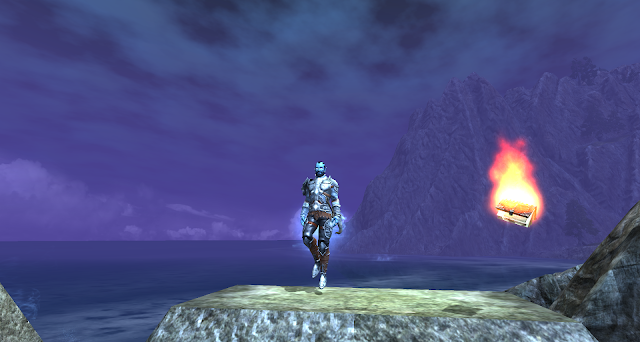 I recently gave some off-the-cuff advice to Wilhelm, who has been playing and writing about EQ2 of late. I suggested that, if he ever got to the point of taking a run at current max level content with anything like serious intent, he probably would need to take a look at the guides at EQ2 Library and take some kind of action on what he found there. Closing in on 25m HP! It occurred to me that perhaps I should be taking my own advice rather than doling it out to other people so I went and read the latest guides on Class Optimization. When I say "latest", I mean the ones from last April. I did read them a few months back but I wasn't really paying attention. This time I not only tried to follow what was being said - I actually logged in to put it into practice. I had thought my Berserker was doing quite well for a casual solo character and looking at the benchmarks for where he should be on various stats he was indeed not looking too shabby. His key stats, Potency and Crit Bonus were already above par for Solo, as were his Resists. The real weakness was his Hit Points. A while back I'd almost doubled his Health, putting him somewhere above the 10m HP mark. More recently, with the aid of the drops I got from Fabled Guk and the rewards from this year's Days of Summer, I'd pushed that to around 18m. That's still a long way short of the recommended 30m (unbuffed) the EQ2 Library guide gives. Yesterday, following their advice, I reset my Prestige AAs. That bumped me to around 20m HP. Then I went to Freeport and crafted all the Planar Health Augments I could afford and socketed them into augment slots. Finally I went through every piece of gear I was wearing and Infused it at least once. The upshot was 23m HPs. Still short but a lot better. I can also see a number of clear upgrade paths I need to follow to improve further. This is the sort of thing that I find very enjoyable in an MMORPG to which I have become committed - and really annoying in one I'm just playing on the side. Since I thoroughly enjoyed myself yesterday, I guess EQ2 is back to being something I take seriously rather than something I dabble with now and then. This morning - between writing paragraphs two and three of this post - I pre-ordered Chaos Descending. I was going to do it anyway but I confess that the reason I did it now was to get the Jann Magi illusion that you can use right away if you stump up the cash in advance. Last year we got the Clockwork Calamity illusion, which I have been using ever since. I have illusions toggled off so I can't see it but I have been enjoying the benefit of its excellent buffs. In EQ2 these days, everything gives you buffs or stat increases. Your mounts do it. Your familiars do it. Every one of your twenty gear slots, of course, does it. Your food and drink do it. Some of your house items do it. Your long-forgotten Deity pet does it. If you're a min-maxer, which thank god I am not, you pretty much need a spreadsheet just to keep track of where your buffs are coming from. Someone thought it was worth highlighting. Even if you aren't particularly keen on these kinds of details you can't afford to ignore them entirely. Familiars and Mercenaries need to be leveled up and mounts will, too, when Chaos Descends. You can't afford to forget your illusions. As I suspected, the new pre-order illusion is an upgrade to the old one, although it's not an exact one-for-one swap. It handily raises all the key stats but there are a few differences. 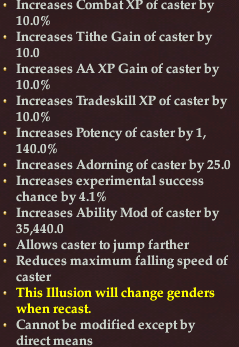 The Clockwork Calamity, very appropriately, buffs Tinkering, whereas the Jann Magi buffs Adorning instead. Whether I'll ever remember to swap them in and out for key moments like that I very much doubt. The Jann Magi also has a couple of unusual advantages. It allows you to jump farther, which is something I haven't seen for a long time, if ever. It also has some form of falling damage reduction. I have a suspicion it simply uses the code from Arisai/Fey pseudo-flight. The most unusual thing the illusion does is entirely cosmetic: it changes your gender. More precisely, it switches from one gender to another each time you recast it. I might be reading more into this than was intended but I found it heartening. Of course, since I keep illusions off, it's something of a moot point. Still, in 2018, it's nice to have the option. All of which leaves me - by far - as well set-up for a new expansion as I've ever been. 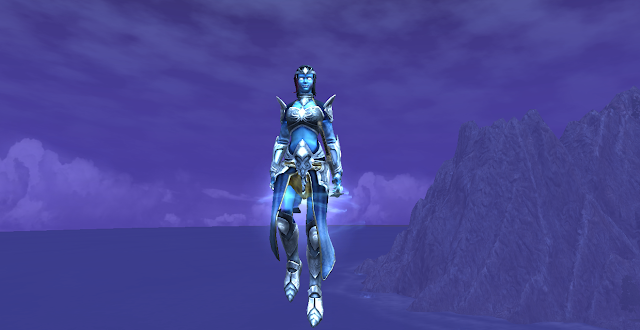 With no level cap increase this time around I'm not expecting to have to replace all my gear right off the bat but it wouldn't be much of an EQ2 expansion if everything I'm wearing now wasn't obsolete in a few months. I plan on muddling along with what I have and whatever the Signature questline gives me until EQ2 Library come out with their next set of benchmarks, probably in Spring 2019. Then I can take another look and start all over again. Holy moly, I thought I was styling when I went from 300K to 2.2 million hit points. You're also sitting on a lot of status there too. But then, the only thing I use status on is the guild hall, and only when I want to open it up for a week to craft a bit. Status has a different function at endgame these days. Among other things, it's one of the currencies used to buy armor and augments from the vendors. That's why double status weekends are such a big deal. Took me ages to realize that!